This is a result for which Bridge the Gap and many others have worked for decades. By 2025 California will be fully free of nuclear power and quite far along on the path away from carbon-based fuels as well. We are showing the world how to move from dirty and dangerous power—fissile and fossil—to safe, clean, renewable energy, with ramifications nationally and worldwide. There are aspects of the deal that, to be candid, are less than ideal. Chief among them is that we still have to get lucky for the next nine years that there won’t be a major earthquake, accident, or terrorist attack, any one of which could produce a massive release of radioactivity. The good news is that about a decade from now, risks to California will be much reduced. 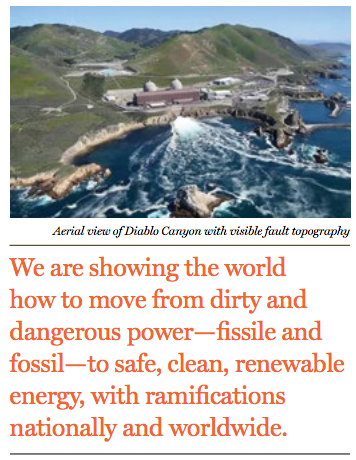 Diablo Canyon has had a troubled history. As I detailed in U.S. Senate testimony two years ago, PG&E claimed at the time the plant was being built that there were no active earthquake faults within 30 kilometers. After the facility was largely constructed, however, the Hosgri Fault was discovered, capable of an earthquake far larger than Diablo had originally been designed to withstand. Rather than undertake a very expensive seismic upgrade, PG&E, with Nuclear Regulatory Commission acquiescence, simply downgraded its estimates of how much shaking the new fault could produce. PG&E sharpened its pencils rather than significantly strengthening the plant. PG&E and the NRC asserted there couldn’t be any more undiscovered active faults nearby. Then the San Luis Bay Fault was found to be active close to the plant, and the Los Osos Fault as well. Not to worry, they said again, there can’t be any more seismic risks they didn’t know about. But then, a few years ago, the Shoreline Fault was discovered, coming within a few hundred meters of the plant. Don’t worry, we were again told, the reactors could withstand the ground motion from the new faults. But then the NRC’s own Senior Resident inspector at Diablo actually reviewed PG&E’s own records and found that its own estimates of the shaking the new faults could produce exceeded the levels on which the design was based in the license. He said the plant should be shut down until either the design was upgraded to meet the license requirements or the license altered. His concerns were ignored by his superiors. PG&E and the NRC also had long claimed that the faults couldn’t be interconnected. 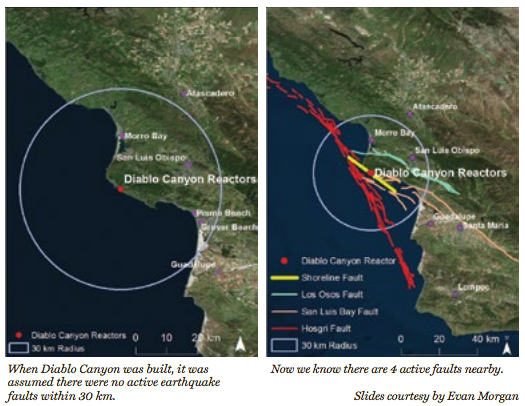 But then new studies forced PG&E to admit that the Shoreline Fault was connected to the San Simeon Fault, and the San Simeon to the San Gregorio Fault, creating one long fault zone extending from south of Diablo Canyon to north of San Francisco, hundreds of miles in length. The longer the fault, the greater the size of the potential quake. Diablo was a terrible mistake. The struggle to prevent and then reverse the mistake has taken the commitment of many, many people, over many, many years. But soon, California will be nuclear free, and the world will be better off.